“This post is sponsored by Kellogg’s. All thoughts and opinions are my own.” I’m sharing a parenting guilt I’ve been holding on to for a while- my kids have too much screen time. I’m also sharing tips on how to cut back on screen time and what to do instead! But, it didn’t. The problem continued to get worse, and I did nothing about it. In fact, I added to the problem by buying into it and not setting any limits. See, I used to set limits. I used to enforce it. But, somewhere along this parenting journey, I fell off the wagon. Yes, I am guilty. And it’s time to come clean. I’ve allowed my kids to have too much screen time over the past few years, and now it’s become a big problem. I believe the problem magnified itself when a particular video game came out last summer. Since then, my three boys have been playing this game non-stop. And when they are not playing games, they are glued to their tablets and phones. All these things we, their parents, have purchased for them over the past few years. But then something within me snapped. My boys were staying up all hours of the night, playing video games with their friends online, which woke me up on a regular basis. And when your sleep is continuously interrupted, there’s only so much you can take. Admit that there’s a problem. I don’t mind my kids playing video games, but I didn’t set limits. I allowed them to play all day and all night. So, the husband and I had a long talk about what needed to change. He reminded me that we are the parents, and it’s our job to set limits and control with our kids. Make changes with input from the kids. We sat the boys down and had a talk with them about what needed to change. Naturally, the boys were not in 100% agreement about limiting their screen time but gave input on our suggestions. Pro-tip: It may seem easier to limit screen time for younger kids, but screen-time limits can be effective for older children as well. Be a role model. Kids model the behavior they see in their parents. Derrick and I both admitted we also spend too much time on our phones and gadgets. And we have not been reading on a consistent basis. So, we are limiting our time on social media and spending more time reading individually and together as a family. If your kids see you modeling these behaviors, this will help the change in routine go smoothly, as well as create an additional way to spend time together. We’ve all heard the saying, “reading is fundamental.” I remind my boys of how essential it is to read on a daily basis. Reading is not only for fun, but understanding what they are reading, learning new words, and becoming a great writer all stems from reading. Kellogg’s and Dollar General understand the importance of literacy, and together with Dollar General’s Literacy Foundation, have this following offer to get books into the hands of kids. I’ve always wanted my boys to be great readers. And, it started out that way. But man, did I let that slip by allowing so much screen-time! Here’s how we are changing this and encouraging more reading time. Find books that interest your kids. When my kids were younger, they were into the Captain Underpants and Geronimo Stilton chapter books. When you’re unsure of what books your kids may be interested in, a trip to the library is necessary. We spent a few hours pouring over a variety of books until each child found at least two books they wanted to read. Challenge them. If your kids are struggling to find the joy in reading, challenge them. Set a goal for them to read a certain amount of books. After they reach their goal, reward them with a prize. Pro-tip: Find a prize that will motivate your children. You can pick up budget-friendly items at your local Dollar General, or allow the kids to go in and pick out their prize. Be sure to set a budget. DEAR. Drop Everything And Read. The boys are familiar with DEAR from school, so we have used that same system in our home. Read during breakfast. Instead of our boys bringing their gadget to the breakfast table, they can bring a book. We are all cereal fans, and each child has their favorite. Our favorite Kellogg’s cereals are Kellogg’s® Frosted Flakes®, Kellogg’s® Froot Loops® Cereal and Kellogg’s® Raisin Bran®. And when they’re not eating a bowl of cereal, or a hot breakfast, grabbing a Kellogg’s® Pop-Tarts® and a piece of fruit is a quick breakfast on the go. Make a list of things you can do as a family. In order for less screen time to work, you need to come up with other things for kids to do. When your kids are younger, it’s easier to find free activities in the community, setting up play dates, and having them play with toys. As the kids get older, playing with trucks and dolls are no longer an option, and you have to get creative. If you need ideas, you can check out our teen summer bucket list for inspiration. Get outdoors. Fresh air is always good for the soul. Send the kids outdoors to play. If they enjoy playing sports, install a basketball hoop, buy a football, skateboard, or other sports equipment. Our boys love playing basketball and will spend 1-2 hours every day outside playing together or walking to the park to play with friends. Encourage their passion. Find out what your kids love to do. Maybe they enjoy acting or building things. Whatever it is, find camps or classes they can take to increase this passion. Our youngest son loves to play basketball, so we enrolled him in a week-long summer camp. Travel. Traveling together as a family means those video games are left at home. And if you plan a fun family vacation, the kids will have so much fun they won’t have time to think about their phones. If you can’t afford to take a vacation, considering day trips or a weekend getaway. Limit their screen time. This one may be easier said than done, but it is possible. After some haggling, we agreed during the summer months; they can play 4-5 hours per day. During the school year only 1 hour per day as long as their homework was finished. Have a set family day. Several years ago I implemented no video games on Sunday. This was our family day. However, in the past year, somehow we got away from that. We are going back to no video games on Sunday. This one is going to be hardest because we let it get out of control, but I’m committed to making this change stick. Set rules. Our boys are not allowed to bring their phones to the dinner time. However, we also stipulated this rule during breakfast and lunch. Through August, you can redeem a free Scholastic book when you purchase a participating Kellogg’s product. Look for the specially marked boxes on the following products as shown below on the Kellogg’s Froot Loops Cereal, Kellogg’s Raisin Bran, and Kellogg’s Pop-Tarts. Other varieties, like the Cheez-It® Baked Snack Crackers, are also included and great for lunches and road trips. You can also save money on Kellogg’s products at Dollar General. They have a sale running on Kellogg’s products, buy 3-mix-or-match items for $6 bucks, plus get an additional $1.00 with this coupon offer. At the end of the day, we are the parents responsible for raising our children to be productive members of this society. We want them to freethinkers, educated, and driven with passion. And while video games and gadgets are not the enemies, we have to set limits. Reading encourages passion, imagination, and creativity. Reading is fundamental; and as parents, we need to encourage our kids to put down the gadgets and pick up a book. 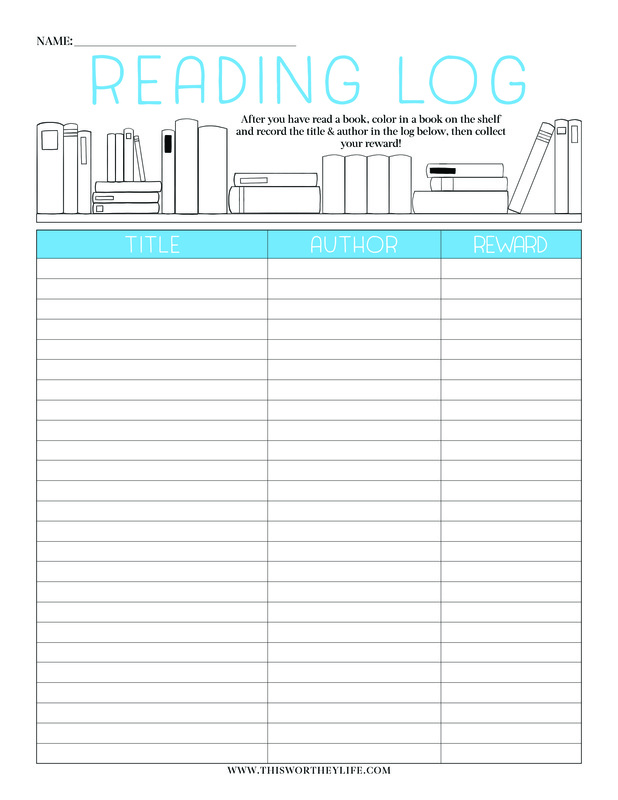 Be sure to print out a copy of our FREE Reading Tracker, which allows kids to log their books and redeem it for a prize. You all are so cute! Especially your hair, mama-worthey! Love.